Riding northbound on Barbur across the Newbury Street bridge. We finally have a bit more clarity around the future of the Vermont and Newbury bridges on Barbur Boulevard. Detail from SW Corridor Preferred Alternative showing Newbury and Vermont bridge. The bridges are notorious because the bike lane drops right before them and it forces bicycle users into a shared lane on a road where people often drive 45-50 mph. 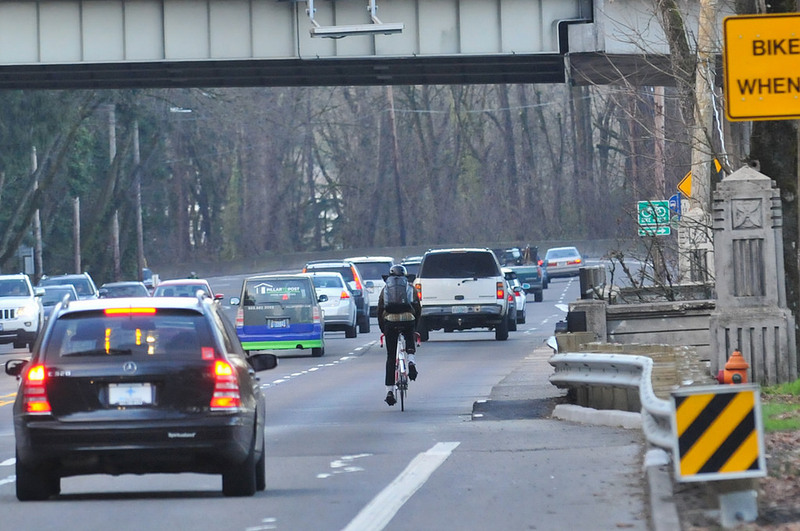 For years, activists and The Street Trust pressed the Oregon Department of Transportation to put that section of Barbur (north of SW Capitol Highway) on a road diet in order to add dedicated space for cycling on the bridges. In 2016 the agency finally embraced the idea and proposed a lane reconfiguration as part of their Barbur Road Safety Audit that would do just that. But that was just a proposal. Today the dangerous conditions remains. With the SW Corridor light-rail mega-project rolling toward its planning conclusion (expected next year), conversations about these bridges are back in the spotlight. Without a promise of where bike facilities would be built, some activists worried they might be left off the table. Pushing for a path alongside the new light rail bridge was the new strategy. Now the plan has changed and people who care about bike access on Barbur can feel a bit better about the prospects of this project. 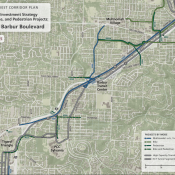 “Design Refinement 1, Barbur Wood East-Side Running, would transition light rail away from SW Barbur Boulevard onto a separate structure to the east for approximately one mile. This refinement was developed to avoid reconstruction of the Vermont and Newbury viaducts in order to reduce project costs, avoid cut-walls and parks on the west side of the viaducts, and to reduce short-term traffic impacts. However, the refinement as designed would include an at-grade crossing of the northbound SW Barbur Boulevard lanes, and introduce risks in adding new bridges over steep slopes near infrastructure associated with ODOT‘s retaining walls along I-5. It would leave the viaducts unchanged from their current condition. This significant change came after the July 30th Community Advisory Committee (CAC) meeting where several people testified about the need for clarity and continuity for bicycle users. … The alignment would continue running in the center of SW Barbur Boulevard into the Woods area. In this section, the existing Newbury and Vermont viaducts would be replaced by two new bridges that would carry four auto lanes, light rail, and improved bike and pedestrian facilities… Continuous bicycle and pedestrian facilities would be constructed along the light rail alignment through Segment A and into Segment B, between downtown Portland and the Barbur Transit Center. Metro expects to adopt the Final Environmental Impact Statement for this project next year and construction could start by 2027 if all goes according to plan. While this assurance of bike access is a good thing, we hope people don’t have to wait another eight years before ODOT makes Barbur Blvd safer for cycling. We’ve reached out to ODOT for comment and will update this story when we hear back. “There’s no agreement yet. It’s still under discussion. 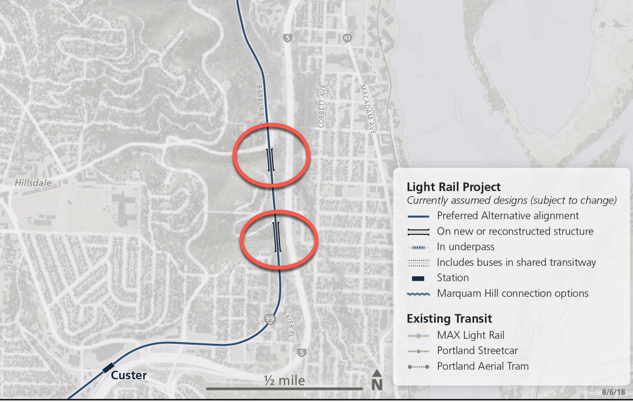 That said, ODOT and PBOT believe the Southwest Corridor light rail should be built across rebuilt viaducts and not a separate light rail structure adjacent to the existing structures. Rebuilding those bridges presents an opportunity to optimize light rail travel times and improve the function of the structures for all modes. The cost difference between building a separate light rail structure or rebuilding the existing structures to accommodate light rail is estimated to be $65 million. As a condition of the city accepting jurisdiction of Barbur Boulevard, which has been part of the discussion, ODOT would provide the City $65 million towards viaduct replacement. H/T to Phil Richman for sharing the Metro email that tipped us off to this story. This is the best news to happen for Barbur in the 16 years I’ve commuted the corridor. Unfortunately I feel certain ODOT will punt on making safe facilities now. Simply dropping one southbound lane and putting in protected lanes for people of all ages and abilities would allow so many more people to roll, walk and scoot instead of drive from just beyond the bridges. We need more public pressure on ODOT to drop that southbound lane. Drivers would be better off too. I would encourage anyone who commutes by bike on this section of Barbur to contact ODOT ( ask.odot@odot.state.or.us ) and ask for Option C of the Barbur Road Safety Audit (exactly what Phil is referencing above) to become a reality in the near term. For the cost of a few yards of concrete, some striping, a trigger and an overhead light, a substantive and tangible improvement could be made as early as next summer, but only if ODOT feels enough pressure. More than half of that right southbound lane already turns onto Capital Highway, so it wouldn’t fundamentally alter the current traffic pattern. But it would GREATLY improve non-auto safety to have dedicated space. How is it this month with one southbound lane closed due to the flyover ramp issue? Apples and Oranges. Both lanes were forced to merge into one, travel for 1/3rd of mile, then split off for CapHwy. That caused a big ol’ backup. Option C (3?) wouldn’t require a merge for the majority of the traffic in the right lane. Unfortunately, the driving public won’t bother to consider this, and will use the recent repair traffic to oppose the proposed change. Neither of my commuter bikes trigger the warning lights on the Barbur bridges so I either have to ride in the lane and hope that someone driving 40-50 mph does not hit me or crab walk along the narrow lip that serves as a footpath. The DEIS just about ignores the 2007-adopted Red Electric Trail from Portland city council. As a SW Portland resident, and former SE resident, I have come to recognize that NO ONE actually plans for any projects in a holistic manner. Why would PBOT / ODOT agree to replace the bridges when the new TRIMET bridge could accommodate everything that SW bike commuters ask for. It seems like a waste of $$$ to rebuild these now when the new bridge is coming. It seems asinine for TRIMET and METRO to ignore ped/bike access on the new train alignment. Why not just do at Phil says and cut 1 south bound lane until the new bridge/ bike routes are built? It would save us $$$ in taxes. Those bridges are something like 80 years old and nearing the end of their functional life. It doesn’t need to happen immediately, but the bridges need to be replaced in the next couple of decades no matter what. I think Metro’s previous plan was to ignore that in the SW Corridor Plan in hopes that ODOT would handle the issue on it’s own, shrinking the projected budget for the SW Corridor. But I agree on that last bit. The lane reconfiguration is dirt cheap and (with some actual chutzpa from ODOT) could be done in a few months, rather than 10-20 years from now with the SW Corridor plan. They are also made of wood(!) As I’ve mentioned here before* this needn’t be difficult or expensive. The ease with which ODOT is willing (or unwilling) to throw millions of our tax dollars around never fails to baffle me. Don’t you think that someone at ODOT feels an incredible sense of achievement at having created four continuous lanes between the Ross Island Bridge and – I dunno – McMinnville? (and probably all the way to Salem or Eugene). ODOT is NEVER going to give them up – the automobile constituency is just too darned powerful. Yes, a lot of cars turn right onto Capitol Hwy, and cars and buses (44 and 94) could easily merge into one lane there. But ODOT will never, ever let it happen, b/c those four lanes are sacrosanct. I am encouraged that ODOT, PBOT, and Metro are moving in the right direction here. Makes absolutely no sense to spend million$ on two new MAX bridges and then turn around and spend million$ more to take down and re-build the Vermont and Newberry bridges. Two new bridges have gotta cost about half of what four new bridges would cost. I never thought I’d see the day. Amazing. But I’ll wait until it’s built to truly celebrate. I’ve found that I have to pretty much nail riding right down the center of the trigger, otherwise it doesn’t go off. Even with the lights flashing and my arm out to signal half the time no one leaves a gap. I had an email conversation with the ODOT engineer who installed the loops awhile back. Apparently they are actually the most sensitive right at the outer edges of the loops. With my crabon-fibre gravelle bike and only a few steel bits, it triggers about 1/2 the time. my two mostly plastic commuter bikes never trigger the loop sensors. Wonderful news! Thank you ODOT and PBOT for finally connecting SW portland to the rest of portland by bike. I remember when we started the friends of barbur group in 2008. Getting this stuff done takes a lot of patience but once it is done every future person will benefit. And my cautious cynicism is partially vindicated. Great News for this project…..If it ever can be funded. Best guess we would require at least a billion of federal money, probably 1.5. The Trump administration has submitted a budget recommending ZERO new money for local mass transportation projects as they “should be paid for by those who use them.”. This will doom the SW Corridor project and the bus smaller Division HCT Busline. despite almost 40 years of evidence-based warnings we continue to increase our total emissions of greenhouse gasses. there is very dark comedy in our complete and utter failure to even begin to address climate change. Part of Mother Nature’s plan for human overpopulation control. Criticism of the administration is sparse in some quarters but it’s open season on budget proposals. That’s an evergreen perquisite of the legislature. I hate to be the bearer of bad news but… as long as the city has some carrot they can hold out in front of us for 10-20 years nothing is exactly what they will do in the short term. Plans made by ODOT and Metro for new or rebuilt structures perhaps a decade from now are orthogonal to the need to address the massive modal imbalance that exists *today*. 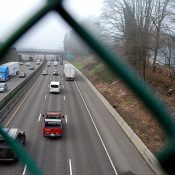 ODOT should implement the lane reconfiguration they ostensibly support, even if just as a trial to determine what the actual traffic needs are for any rebuilt structures in the future. I commute those bridges daily on a bike, and it’s terrifying. I’ve had so many close calls. If you don’t take the lane, they don’t give you any room and squeak by you at high speed. If you do take the lane, a large percentage of the time, some impatient crazy will zoom around, with the ol’ graze the bicyclist by inches at fifty mph to teach them a lesson move. It’s the fastest, easiest, flattest route route from a lot of SW. I’m sure many more people would ride it if the bridges weren’t so darn dangerous. 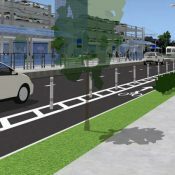 Using a lane for bikes and peds only would be the right thing to do for the interim .